We present a high-sensitivity radio continuum survey at 6 and 1.3 cm using the Karl G. Jansky Very Large Array toward a sample of 58 high-mass star-forming regions. Our sample was chosen from dust clumps within infrared dark clouds with and without IR sources (CMC–IRs and CMCs, respectively), and hot molecular cores (HMCs), with no previous, or relatively weak radio continuum detection at the 1 mJy level. Due to the improvement in the continuum sensitivity of the Very Large Array, this survey achieved map rms levels of ∼3–10 μJy beam−1 at subarcsecond angular resolution. We extracted 70 continuum sources associated with 1.2 mm dust clumps. Most sources are weak, compact, and prime candidates for high-mass protostars. Detection rates of radio sources associated with the millimeter dust clumps for CMCs, CMC–IRs, and HMCs are 6%, 53%, and 100%, respectively. This result is consistent with increasing high-mass star formation activity from CMCs to HMCs. The radio sources located within HMCs and CMC–IRs occur close to the dust clump centers, with a median offset from it of 12,000 au and 4000 au, respectively. We calculated 5–25 GHz spectral indices using power-law fits and obtained a median value of 0.5 (i.e., flux increasing with frequency), suggestive of thermal emission from ionized jets. 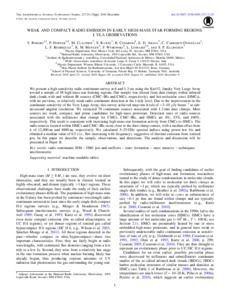 In this paper we describe the sample, observations, and detections. The analysis and discussion will be presented in Paper II.